The title of this chapter indicates that it will be concerned with the vision of the uncreated Light in the human nature of the Word, whom the Disciples saw on Mt. Tabor, but it suggests that there will be special reference to the vision of God which is attained by the Hagiorite fathers who live the ascetic life on the Holy Mountain. The event of the Transfiguration did not happen just once in history. Of course this particular event took place once, because Christ wanted to prepare His Disciples to face the Passion and His Cross with faith, but it is repeated and experienced by the deified in all ages. The holy hymnographer prays to God: "Make Thy eternal light shine also for us sinners". On the Holy Mountain both in the desert and in the Monasteries there are monks in all the stages of the spiritual life, that is, in purity of heart, illumination of the nous and deification. Some are struggling to cleanse their hearts of the passions and are living in deepest repentance, others have attained illumination of their nous and have unceasing prayer in their hearts, and others have attained the vision of God and have seen the uncreated Light. During the twenty-five years when I was making regular visits to the Holy Mountain, God granted me to meet monks belonging to all the stages of the spiritual life. I found monks who told me about noetic prayer and the vision of the uncreated Light, and therefore I have certainty about these realities. Since this chapter will deal with the vision of the uncreated Light on Mt. Tabor I want first to speak of the monks who saw the Light. I met a monk who, though he was blind, saw priests in bright robes, and he asked whether they were priests of that cell, without thinking that he was blind. Essentially, this is a matter of saints appearing, but in his very deep repentance and humility he could not become aware of it. I also met a monk who several times answered the question "how is it going" by saying "I am living in darkness", for he was not seeing the uncreated light, which means that he had experience of God in the Light. They also tell about monks whose faces shine, gleaming with the glory of God during their sleep. I recall a striking case. After the publication of the book "A Night in the Desert of the Holy Mountain" I visited a Hagiorite monk. He said to me: "Many people ask me whether I am the monk with whom you were talking. I answer them: Do not try to find out who it is. Try to take the advice and live the prayer about which the book is speaking". And then he said to me: "Come and I’ll tell you several other things so that you may know and can add them later". And to my endless surprise he began to tell me experiences of the uncreated Light, what comes before the vision, what follows it, in what state the person is, what tears have to do with the vision of God, and so forth. I was left astonished and thanked God for this great gift which He is giving to the Holy Mountain and to His Church and was also giving to me personally, that I should meet such great personalities, who are even today still living in our midst. Therefore I can exclaim with certainty: "And we have heard and seen, and our hands have touched". But fortunately we have written testimonies about the vision of the uncreated Light. Several Hagiorite monks, for many reasons, chiefly to help the Christians whose faith was wavering, came to the point of revealing their experiences. Thus we have written testimonies of this life. In what follows I should like to mention four such testimonies, which show the value and importance of the Holy Mountain. "The Father also has other such garments, but my own spiritual hands have been paralysed by my many sins and I cannot loose them for the present to pray. May the good Father forgive me for this and for the fact that I have defiled his name, which he gave me. It is true also that I have not imitated him in any way. And while I was regarded as a young scamp the indulgent Father Arsenios, as an imitator of Christ, was vindicating me by his love. It seems that for years he was collecting all his love for me in order to give it to me at one time and to jolt me, careless and insensitive as I am, into recovering my senses. It was the day of the Saint Theodores, the twenty-first of February, 1971, All Souls’ Day. I had written his biography for the first time, from the materials which I had then and was reading it, in case I might have happened to make any mistake in the translation of the Pharasiotiki which I had heard from the elders. 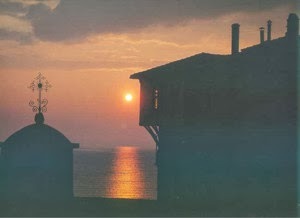 It was two hours before sunset, and while I was reading, Father Arsenios visited me; and just as a teacher caresses his pupil who has written the lesson well, he himself did the same thing to me. Along with this, he allowed me an inexpressible sweetness and heavenly elation in my heart, which was impossible to endure. Then I ran out to the grounds surrounding my Cell like a fool and called out to him, because I thought that I would find him. (Fortunately no visitor had come, because he too would have been troubled and I could not have told him the reason for this holy madness in order to reassure him). Sometimes I was calling out loudly: 'My Father, my Father!' And sometimes I was calling more softly: 'My God, my God, hold my heart quite tightly until I see what is going to happen tonight!' For my heart of clay could not possibly endure that great Paradisaical sweetness unless God helped me. When night had already fallen and my hopes had subsided – for I had thought that I would find him – I no longer looked to Heaven. What made me go back into my cell was when I remembered the day of the Lord’s Ascension. When after forty days Christ visited the Panagia with His disciples for a moment on Ascension Day they saw Him being taken up into the Heavens before their eyes. "And one day many experiences happened to me. All that day I was crying out with quite great pain. And already in the evening at sunset I was resting: fasting, exhausted from the tears. I was looking at the church with the Transfiguration at the top, and, wilting and wounded, I was calling on the Lord. And it seemed to me that a strong wind was coming to me from there. And my soul was filled with an ineffable fragrance. And at once my heart began to say the prayer like a clock noetically. I got up then full of grace and immense joy and went into the cave. And bending my chin to my breast I began to say the prayer. "At one time the spirit of despair laid hold of me - it seemed to me that God had finally rejected me, and there was no salvation for men, that, on the contrary, my soul bore evidence of everlasting damnation. And I felt in my soul that God was merciless and deaf to entreaty. This lasted an hour or a little over. An emotion of this kind is so oppressive, so harrowing, that even to recall it terrifies. The soul cannot bear it for long. In moments such as these man may well be lost for all eternity. Such was the battle which the Merciful Lord allowed the spirit of evil to wage with my soul. ‘Lord Jesus Christ, have mercy upon me, a sinner’. And as I uttered these words I saw the living Lord in the place where the icon was, and the grace of the Holy Spirit flooded my soul and my whole body. And so it was I came to know through the Holy Spirit that Jesus Christ is God; and I was filled with a sweet longing to endure suffering for His sake. "Early in the 1930’s – I was a deacon then – for two weeks God’s tender mercy rested on me. At dusk, when the sun was sinking behind the mountains of Olympus, I would sit on the balcony near my cell, face turned to the dying light. In those days I contemplated the evening light of the sun and at the same time another Light which softly enveloped me and gently invaded my heart, in some curious fashion making me feel compassionate and loving towards people who treated me harshly. I would feel quite a sympathy for all creatures in general. When the sun had set I would return to my cell as usual to perform the devotions preparatory to celebrating the Liturgy, and the Light did not leave me while I prayed. One evening a monk from a cell near mine came to me and said, ‘I have just been reading the hymns of St. Symeon the New Theologian. Tell me, what do you make of his description of his vision of the Uncreated Light?’ Up to that moment I had lived with a grateful heart for the Lord’s blessing upon me, but had not posed any question about the occurrence - my thoughts were fixed upon God to the exclusion of self. In order to answer Father Juvenaly I reflected on what was happening to me at the time. Trying to cover up, I answered evasively. ‘It is not for me to pronounce upon St. Symeon’s experience. But perhaps when grace was with him he was conscious of it as Light. I don’t know.' I had the impression that Father Juvenaly retired to his cell without suspecting anything more than I had said. But soon after this brief exchange I began to pray as usual. Light and love were no longer with me. I have presented these four written testimonies from the Hagiorite fathers themselves in order to show that in each epoch, and so today as well, on the Holy Mountain there are witnesses to seeing the Light of divine glory. Of course there are others who see God and whom we do not know, on the one hand because they themselves wish to live in obscurity, on the other hand because God has not mainfested them. If there are special reasons, God will reveal them. St. Gregory Palamas also belongs to the category of those Hagiorite Fathers who see God. He himself, as St. Philotheos Kokkinos describes, had experiences of God many times, but also participation in the deifying energy of God. His way of writing and the way in which he analyses the texts of the holy Fathers manifest his personal participation in the uncreated glory of God. From the book St. Gregory Palamas as a Hagiorite, ch. 11.